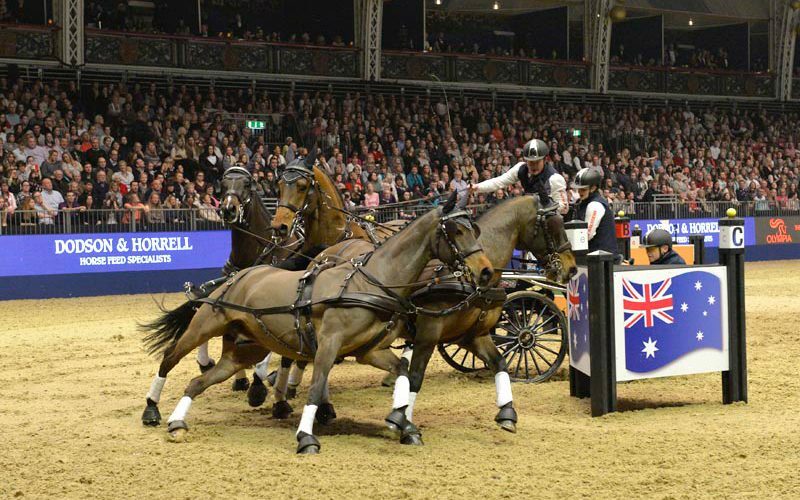 The world’s leading driver Boyd Exell (AUS) showed the enthusiastic full house at Olympia just why he deserves that title. 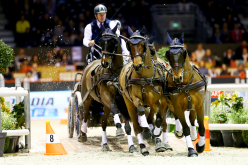 The six times World Cup™ Driving Champion and four times individual gold medallist, drove two peerless rounds in the final leg of the FEI World Cup™ Driving to take the win. 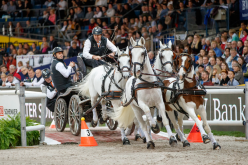 Finishing in third place last night in the qualifying round, behind Hungary’s Jozsef Dobrovitz snr and Koos de Ronde (NED), meant Exell took on the course before them. 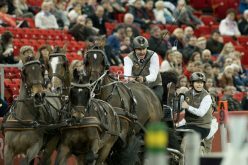 Up until then only one of the four previous drivers – Georg von Stein from Germany – had posted a clear round. Exell showed his intent by driving clear and clipped ten seconds off von Stein’s time. Following him, Dobrovitz and de Ronde both drove clear but Exell took the lead by some three seconds. 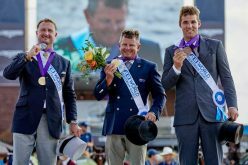 The top three competed again over a shortened course, starting from a zero score. Dobrovitz lost time at obstacle one attempting a tight turn and then had a knockdown at obstacle two. De Ronde pulled out all the stops and secured a very fast time but in doing so picked up five penalties. Exell only had to drive clear but that was no barrier to him putting his foot flat to the floor. 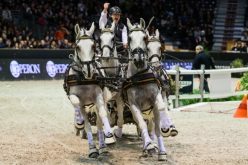 He galloped home clear two seconds faster than de Ronde to notch up his third win in FEI World Cup™ Driving qualifiers this season, keeping him in the top of the rankings. 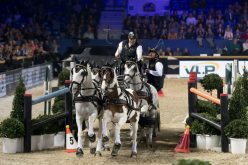 All three top drivers paid tribute to the highly-charged atmosphere at Olympia where the crowd are so enthusiastically engaged with the competition. “I feel on home ground here,” remarked Exell who moved from the UK to Holland two years ago. “That does increase the pressure for me but equally we are all lifted by the crowd. 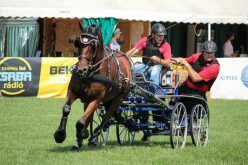 The Show is the one we want to be at.” A sentiment endorsed by Dobrovitz competing here for the second year running.